A secondary student who plays track and field recently won the 5,000-meter run with tears in his eyes after he reaches the finish line. It was a tear of joy for his victory in the said sports field and also because of the prize he got from winning that he will use to build their house. Ilocos Sur held the 61st Palarong Pambansa where the best athletes in the country joined the said event. Usually, the winners from this event only receive medals and certificate from the officials of the said event. However, several localities and regions have their own tactics to encourage other athletes to join the Palarong Pambansa and try their best to win and get as many gold medal as they could from the said event. The Palarong Pambansa gold medallist from every delegation will receive a total of Php 20,000 from the Region 10 Department of Education (DepEd) office. The athletes and their coaches knew about this prizes, and they were surely doing their best and aim every gold of each game. Erwin Mancao is a long-distance track and field player from Villanueva National High School in Looc, Misamis Oriental who was one of the gold medallists of Palarong Pambansa 61st edition. 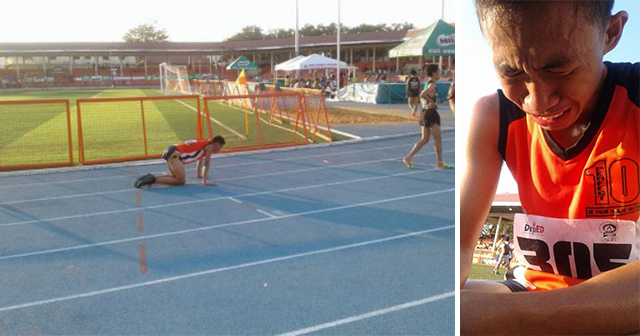 Erwin crawled on the oval track of Quirino Stadium in Bantay, Ilocos Sur, and cried after finishing and winning the 5,000-meter run with an official time of 16:01.60. It was a tear of joy and relief, because of the years he spent in training had finally paid off in the end. It was his first time to win the gold after competing three times in the Palarong Pambansa. According to him, “Masaya ako dahil nakamit ko na rin ito (gold medal) saw akas”. What’s more impressive with Erwin, is he’s putting the prize he gets to good use by helping his parents to build their house and not to buy expensive things like gadgets, phones or clothes. Erwin said, “Kasambahay po ang Nanay ko at sa niogan naman ang tatay ko. Yung incentive kop o dito gagamitin naming upang ipagawa ang bahay naming”. Congratulations to you Erwin, keep it up, we salute you!.